Buying the best binoculars for deer hunting will be the best gift you get for yourself if you hunt. However, it’s not always easy to find one. You’d need to take your time to carry out the much-needed research and then decide on which pair of binoculars to settle for. The scope of your research would cover the right magnification, size, width of the field of view and other key factors. Alternatively, you can relax, and scroll through our thoroughly researched guide which includes a rundown of recommended binoculars that will make your hunting adventure less stressful and much more fruitful. The primary reason you’d be taking a binocular along with you when you go deer hunting is to get closer views of your targets and to do that you’d need a powerful device to bring every detail closer to you. Though the definition of a perfect binocular always boils down to individual preference, a quality device between 8X to 12X would do a great job. Have it in mind though that the difficulty of keeping your views steady increases with the magnification of your binoculars. Hence, going higher than devices within this range can make you struggle big time with stability while going below 8X doesn’t bring far away targets close enough to your eyes. Animals are more active during the hours of less lighting such as at dawn and at dusk. Experienced hunters know this already which is why they seek binoculars that can be relied on in such conditions. The size of the objectives determines how efficiently binoculars are able to gather light even when there isn’t enough of it. 42mm lenses are great, devices with objectives of this size are referred to as “standard sized” because they manage to strike a delicate balance between size and the level of brightness they provide. Objectives reaching 50 mm gather even more light and offer more regarding exit pupil but they make binoculars rather bulky; these are great if you don’t mind having to deal with some extra weight though. Opting for standard compact binoculars isn’t a smart choice to make when buying a binocular for deer hunting. 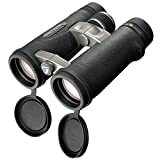 Very light binoculars can be difficult to keep stable too and the small size of the objectives makes such binoculars unsuitable for low light conditions. 8×42 binoculars are great in this regards. They provide excellent images and come in manageable sizes but it’s equally important to check on other features that help keep the weight as low as possible. 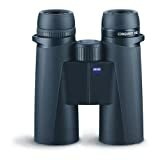 Quality magnesium and aluminum chassis, as well as roof type prisms, also help keep the weight of binoculars in check. The weather at the woods or wherever you hunt deer wouldn’t always be friendly and your binoculars should be well-prepared and rugged enough to withstand such adverse situations. It is recommended that you buy binoculars that are fog proof as well as waterproof. O-ring seals and an inert gas purging are ways manufacturers achieve these key features; so always look out for them. You won’t need to out searching for a new pair of binoculars anytime soon if you invest in the right device. The internal and external components of your binoculars should be made of top quality materials. The housing, its rubber armor, optics and their coatings should be constructed to last a long time. Make sure the ergonomics suits your needs for example; the eyecups should be adjustable to enable you to observe freely through the binoculars even if you wear glasses. What better device to have on top of the list than this piece of optical magic. The Bushnell trophy XLT 8×42 binocular comes with several awesome features that will make your hunting endeavors more productive. This standard size binocular looks great and works great as well. The housing features a durable camouflage rubber armor which enables the binocular absorb shock, provide a non-slip handling and makes you hard to be noticed by the deer you are stalking. The 8×42 Trophy XLT binocular is quite bulky at a total weight of 2 lbs. (907.2 grams). But this shouldn’t prevent you from getting them as they provide an excellent level of light transmission and image clarity. Rain and temperature fluctuations would never be an issue because these Bushnell binoculars are O-ring sealed and nitrogen purged to make them fully waterproof and fog proof. The BaK-4 prisms and fully multi-coated (FMC) optics provide sharp images of the targets without any chromatic aberration at the edges of your view. Impressive low light imaging performance. The weight at 2 pounds might be too bulky for some deer hunters. 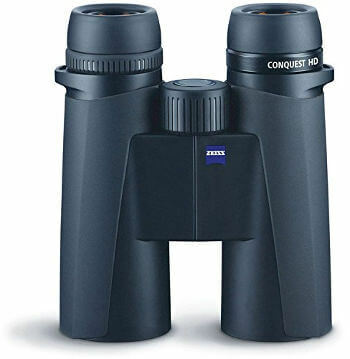 This high end Conquest HD 10×42 binoculars from the renowned manufacturers Zeiss is specially built to meet every deer hunter’s needs. Premium quality materials were used in the construction process and there is no questioning the durability of this wonderful pair of binoculars. The 10x magnification power brings far away targets very close to you while the 42 mm objective lenses keep your views bright enough in all situations. Thanks to the decision to use ED (extra-low dispersion) glass, views are in high definition even when your target is in motion. The exterior is fully armored which eliminates any chance of your binocular slipping even in wet conditions. 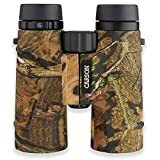 Besides this quality binocular, you get all the accessories you need to complement your binoculars in the delivery box; these include; a well-padded carry case, lens cleaning cloth, straps and the objective lens covers. Quality accessories included in the box. This binoculars are relatively pricy but not to the extent that you’d need to break your bank. The Vanguard Endeavor 10×42 binoculars managed to scoop the award for best value for money binocular in the year 2013 and that’s no mean feat. It makes our list of recommended binoculars for deer hunting for that and so many other obvious reasons. It has a long eye relief of 16.5 mm which is rare to find in such a high powered binocular and a great value for hunters who wear glasses. It incorporates extra-low dispersion (ED) glass which delivers true color and sharp views by preventing any color aberration. The ergonomic open hinge design makes holding the device much easier and also features a large centrally placed focus wheel that is easily adjustable. The material of construction is robust and lightweight; which is part of the reason why these full-sized bins weigh just 730 grams. Dimensions are 6.1 inches x 5.1 inches x 0.1 inches. The lenses are fully multi-coated, and the prisms are phase-corrected while the field of view at 1000 yards is 342 ft. All in all, this is an amazing binocular for deer hunting. Impressive level of imaging performance. 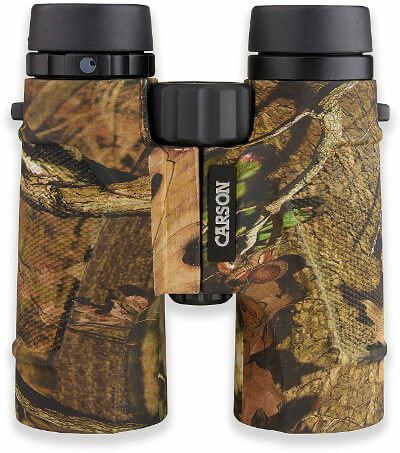 No significant con but few have asked for a closer minimum focus distance than the stated 8.2 ft.
With 10×42 binoculars from the Carson HD series, you get a quality binocular which comes in a beautiful and lightweight design. Great efforts were put into keeping this 10x binoculars at just 641g so that your arms don’t tire easily when you use them to stalk a deer for long periods. We are only interested in bringing you the best quality binoculars that wouldn’t disappoint which is why like other devices on our list, this binocular comes with ED glasses and phase corrected roof prisms. The eyecups are adjustable and the eye relief is an outstanding 16 mm. The central focus wheel is ergonomically placed to allow you make adjustments easily and the rubberized camouflage armor allows you to blend with the surrounding and provides a solid grip. O-ring seals keep this binoculars waterproof while the nitrogen purging of the housing prevents any fogging of the internal components. A diopter adjustment on the right eyepiece allows you to correct any difference you observe in both eyes while enjoying quality views on the 105m/1000 meters field of view provided by the binoculars. The biggest one on our list is the 12×50 long range high powered binocular from the Celestron Granite Series. The 12x magnification makes your targets seem like they are right next to you. Views are bright in all condition; thanks to the 50 mm objectives that let in sufficient light even at dawn or dusk. The ED glass and BaK-4 prisms come with top quality coatings that keep reflections at the barest minimum and enhances light transmittance. For a binocular of this size, the 15 mm eye relief is highly remarkable and the minimum focus distance of 9.8 ft. is equally impressive. The smooth black rubber armor covering most parts of the exterior features thumb grooves to enhance the quality grip the binoculars provide. The twist-up eyecups are easily adjustable and you get a diopter adjustment on the right eyepiece. The phase coated roof prisms also come with a dielectric coating while the optics is fully multicoated for a high level of sharpness, color fidelity and saturation. The binoculars are waterproof and you get a field of view of 280 ft. at 1000 yards. High magnification brings details astonishingly close. Impressive 9.8 ft. minimum focus distance. At 1.73 pounds, the binoculars are heavy and can be difficult to hold up for long periods. 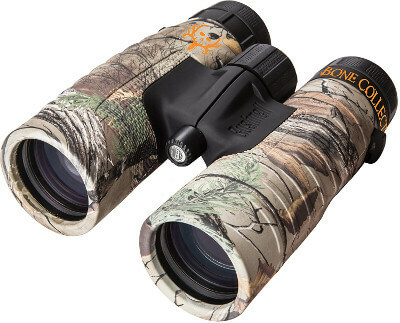 Lots of features make a pair of binoculars great for deer hunting and we’ve discussed virtually all of them. Basically, your binoculars should have sufficient magnification power to bring your targets closer. You must be comfortable holding your binocular up for long periods and it should be adequately weather resistant so it doesn’t get faulty when the conditions get harsh in the wild. Deer hunting is only fun when it is productive and that’s why you should go get one of the best binoculars for deer hunting; you now know how to find one.